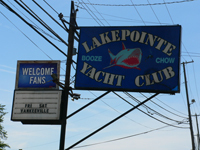 The Lakepointe Yacht Club is located right on Newburgh Lake. This bar is known for their hot young bikini waitresses. They have a full menu with good food and their drinks are pretty cheap. Its much better than Hooters if you're looking for eye candy.